Press the [BALANCE] button at the bottom left of your screen and you will see the balance controls in a little BALANCE box that displays on the bottom two rows of the MAIN screen. 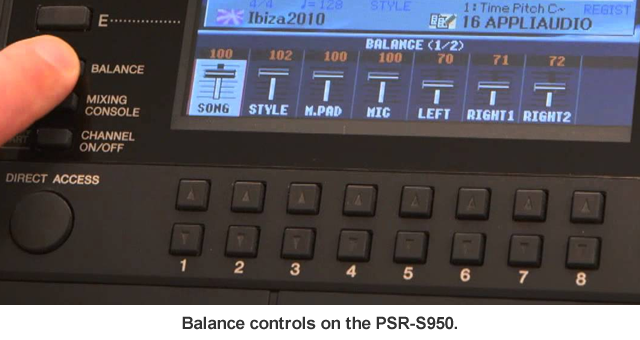 An enlargement of that area on the PSR-S950 is shown below with a picture of the same controls on the PSR-2000 in the next paragraph. 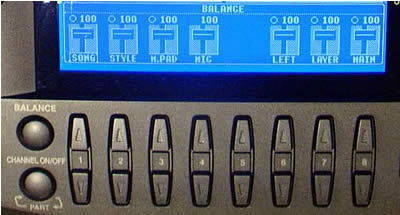 The screen simulates a volume control for 7 separate components (SONG, STYLE, M.PAD, and MIC are on the left and LEFT, LAYER, and MAIN are on the right). On keyboards after the PSR-2000/2100, LAYER and MAIN were switched to RIGHT1 and RIGHT2. The slide controls are shown positioned at a value of 100. The volume can be made louder going up to a maximum value of 127. It can also be turned down all the way to a value of 0 at which point you will hear nothing coming from that particular part. The Tyros 3 [BALANCE] button actually cycles between two slider displays. The first one is similar to that of the original PSR-2000 although it shows a RIGHT1, RIGHT2, and RIGHT3 instead of LAYER and MAIN. The second screen has a slider control for the Hard Disk Recorder (HDR). It also allows you to adjust the balance between keyboard parts. The KBD slider adjusts the LEFT/RIGHT1/RIGHT2/RIGHT3 voices relative to the volumes set for the other PARTS. In the screen shot here, the left and right hand voices are set at a maximum of 127 relative to the 100 level used for the STYLE and M.PAD. You move the volume control up (or down) by pressing the corresponding numbered buttons shown below the main screen. The buttons are numbered  to  , but there are actually 16 buttons since each "number" has a button above it and a button below it. In this case, the top buttons serve to move a "slider" up and the bottom buttons move the slider down. I will refer to the button Above a number as [#-A] and the button Below a particular number as [#-B] to distinguish between the two buttons. For example, pressing [2-A] will increase the volume of the style accompaniment while pressing button [2-B] will turn the style accompaniment volume down. You will encounter other screens in the PSR and Tyros that show two "rows" of information at the bottom of the display screen. In these cases, the buttons above the number are used for the "top" row and the buttons below the number are used for the "bottom" row. For example, when you want to SAVE a file, you are given an opportunity to "NAME" the file. The Name Input box is shown here. This name input screen shows two rows with 8 options available in each row. The choices in the row beginning with CASE, are selected by using the buttons Above the corresponding number while the choices in the row beginning with ICON, are selected by pressing the buttons Below the corresponding number. Thus button [8-A] would select OK, while button [8-B] would select CANCEL. Using this box to input new names is discussed elsewhere. The [1-A] and [1-B] buttons control the SONG volume. If you are playing along with a MIDI song, these buttons adjusts the volume of the MIDI file relative to the MAIN voice (and\or LAYER voice). Buttons [8-A] and [8-B] adjust the volume of the MAIN voice while buttons [7-A] and [7-B] adjust the volume of the LAYER voice. The  buttons control the volume of ALL of the individual STYLE parts. If the style you are using has, for example, a drummer, a bass player, a pianist, and a guitar player, moving the "STYLE" volume up will increase the volume for each of the four players in equal proportion. If the style seems too loud to your ears when matched with whatever you are playing with your right (and left) hands, you can tune all of the accompaniment pieces down by using this balance control. If you want to make one of the accompaniment parts louder than the others, for example, increase the sound of the bass player without also increasing the sound of the drummer, pianist and guitarist as well, you will have to use the Mixing Console. Adjusting individual style parts is discussed in the Mixing Console lesson. On the PSR-2000 and PSR-2100, the  buttons control the volume of the LEFT voice;  controls the LAYER voice, and  controls the MAIN voice. The lettered buttons on the upper right-hand side of the main screen ([F], [G], and [H]) are used to select the MAIN, LAYER, and LEFT voices respectively. You select the voice prior to changing the instrument used in that voice. The buttons labeled [MAIN], [LAYER], and [LEFT], located just to the right of the main screen, are used to turn these voices ON or OFF. If you are adjusting a voice and making it louder and louder but you don't hear any difference, check to make sure that the voice you are adjusting is actually turned ON -- the little light next to the relevant voice button will be on. On the PSR-S950 and other PSR keyboards after the PSR-2100, the right-hand voices are known as RIGHT1 and RIGHT2. The buttons that turn these voices on and off are located on the right-side of the keyboard in the PART SELECT section. Note that keyboards that do not support a microphone, like the PSR-S750, will not have a balance control for MIC. With the introduction of the Tyros, Yamaha offered three right hand voices and these were labeled RIGHT1, RIGHT2, and RIGHT3. All the Tyros models have had three-right hand voices. The  buttons located below the M.PAD label control the volume of the four Multi Pads. If you intend to use the multi pads while you are playing, do not forget to set this volume appropriately. If you lower the STYLE volume and do not adjusted the M.PAD setting, you could be in for a rude shock when you press that multi pad button and hear a bunch of brass horns (or whatever your multi-pad is set at) start blazing away! If you are not using a microphone, you need not worry about the MIC setting -- button . However, if you do use a mic, you will want to do some experimenting to find the mic volume most appropriate and set the volume accordingly. Take a look at the Registration lessons to see how you can SAVE all these settings so you don't have to make these adjustments every time you want to use your arranger.